HCCI engine is a hybrid of spark ignition (SI) and compression ignition (IC) diesel engines with a goal to theoretically harness advantages of both in a single setting. Similar to SI engines, a homogeneous fuel/air mixture is inducted into the engine. During the compression stroke the temperature of the mixture increases and reaches the point of autoignition; i.e. the combustion is initiated without the help of any ignition system. The early studies of this phenomenon were conducted on two-stroke engines with the goal to reduce the hydrocarbon (HC) emission at part load condition. The historical development in two-stroke engines by itself is educational. In the l970s, Eiji Toyoda, founder of Toyota Motor Co. In Tokyo, experienced the abnormal run-on behavior with his motorcycles and challenged his staff engineers to explain it. Masaaki Noguchi and a team of researchers from Toyota and Nippon Soken Inc. investigated this unusual effect, and determined that it was caused not by the assumed hot spots but by an interaction between fuel chemistry and the temperature and pressure conditions in the engines’ cylinders. Specifically, the self-ignited combustion tends “to occur at relatively low cylinder pressures and temperature (compared to diesel combustion), presumably by virtue of inter­mediate reaction products [active radicals]”. Using partially-transparent optical engines with quartz observation ports, the researchers detected that the stable combustion behavior was characterized by an intense blue glow, which was later shown to be the fluorescence of active radicals. The group named the phenomenon Toyota-Soken combustion. Around the same time, Shigeru Onishi and his coworkers at Nippon Clean Engine Research Institute Co. Ltd. showed a small single-cylinder motor/generator set (called the nice engine) that ran with no spark. The team called the phenomenon they observed active thermo-atmosphere combustion. In both these research projects, the engineers could make their engines operate sparkless on radical-initiated combustion, but only at constant speed and load. They had, however, determined some empirical characteristics of this third type of burning. The autoignition occurred only at low loads, when there was a large amount of hot residual gas in the cylinders. As the temperature rose further during the compression, the initiating reactions in the fresh chargewere beginning, and the hydrocarbons in the fuel were breaking down into simpler compounds and activated radicals. Similar effects can be achieved in four stroke engines as well. Like an SI engine the charge is well mixed which minimizes particulate emissions, and like a diesel engine it has no throttling losses, which is beneficial for the part load operation. In addition, the HCCI engine can operate at diesel like compression ratios, leading to comparable efficiencies. The distinction is that, unlike either SI or CI engine the combustion occurs simultaneously throughout the cylinder volume rather than within a flame front. Hence, pressure rise is very rapid particularly when an stoichiometric or rich mixture is used, for example, under high load conditions. See Fig. 1 for examples of SI and HCCI pressure traces. 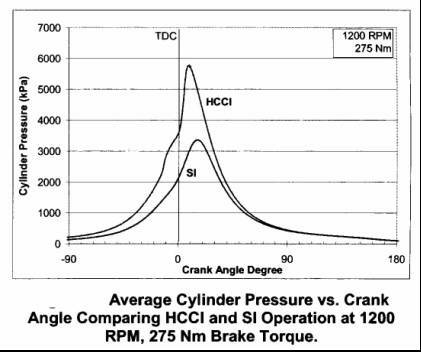 Many investigators observed knock-like pressure oscillations in HCCI engines under high load conditions. However, one feature of the HCCI engine is that auto-ignition can be achieved with very lean overall mixtures (much leaner than can be ignited by spark ignition). This by itself, almost eliminates the requirement of throttling at low engine loads. It worth indicating that one main reason in throttling spark ignited engine is to ensure spark ignitable mixture. It should be obvious that there is no explicit timing for the HCCI combustion. This is considered as one of the unresolved and actively researched areas to best control HCCI combustion in each cylinder. It was shown that H, OH, and HO2 radicals play key role in autoignition process. In general, the concentration of the hydrogen peroxide (H2O2) increases in time and then begins to decompose (at temperatures between 1050 to 1100 K) at high rate to hydroxyl (OH) radicals. This reaction produces a large number of OH radicals, most of which then react with fuel molecules to generate water and heat. The increased temperature brings the system into a very effective chain branching state. 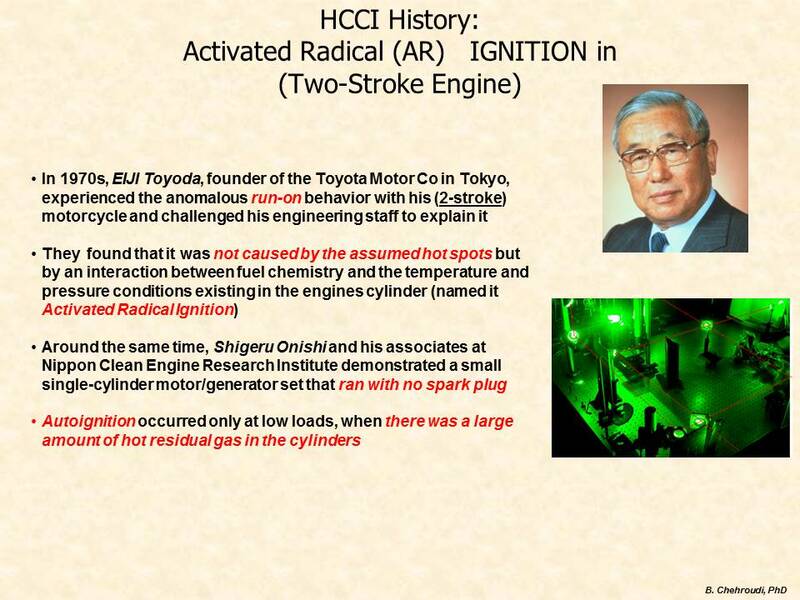 The fundamental chemistry of HCCI autoignition appears to be identical to that of knock in SI engines. 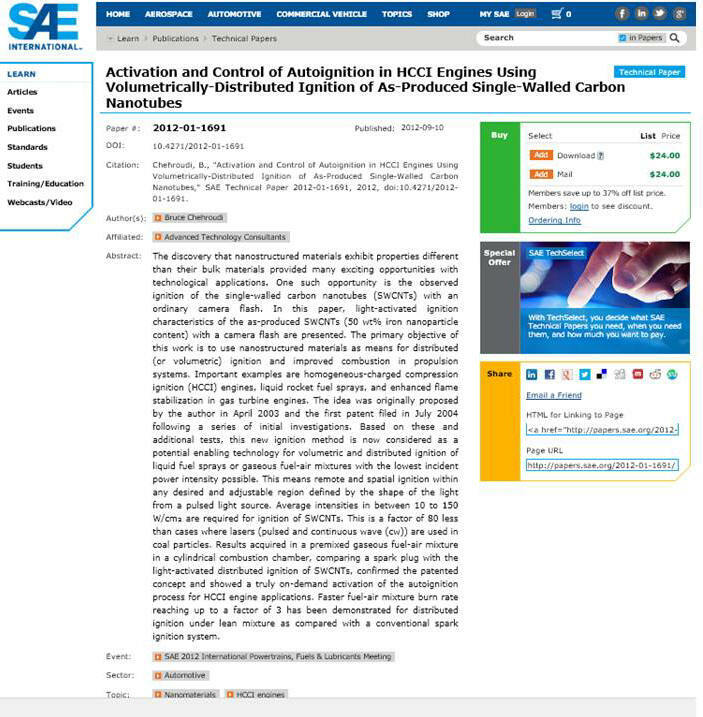 However, the picture does not favor the notion that “active radicals” in the residual burned gases survive both the exhaust and intake processes to play a role in HCCI autoignition process in the next cycle. Current research activities cover areas such as control, startability, emissions of hydrocarbon and carbon monoxide, power density, and transition to other modes of operation, that is SI or diesel. For more information refer to SAE 2001-01-2511 and other SAE literature.